The new women’s watch Admiral's Cup Legend 38 Mystery Moon in its design has retained all the key elements that over 50 years of existence of the landmark’s unique image in the history of the Admiral's Cup collection, remained as a classic of its genre. The brand’s masters masterly express the poetry through technical skills: the watch dial is "surrounded" by 12 nautical flags, located inside the watch case, made in the famous 12-carbon. On the dial there are located the pointer of moon phases and date display, which seem to play “touch and run” in a small space of the dial, vainly trying to catch up with each other. Their motion provides an exclusive patented caliber Corum - SO384 - one of the most striking landmarks of technological development collection Admiral's Cup, which is now, however, is more consistent with women's desires. As it is well known the watches Admiral's Cup for over 50 years are dedicated to those who "goes sailing." In 2011 the watch has received a new interpretation: the case became thinner, lines - softer, and the mounting lugs are more rounded: the line was called Legend. 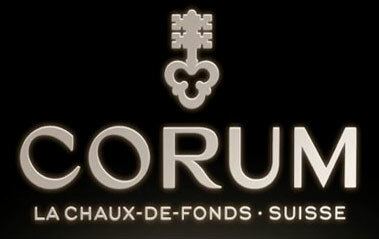 Restraint and classic style of this line became a new word in the design of sporty watches by Corum. It is these elements appeared in the new Admiral's Cup Legend 38 Mystery Moon watch, which the creators themselves describe as "high art of watchmaking in captivating form." The moon phase indicator and date aperture deserve a special attention. So, the pearl moon disc appears in the window of matt metal indicator, on which are shining six precious stones, depicting stars. This little "piece of the Universe", in essence, is a circular window with a facet, which is "echoed" the aperture of the date, placed on the opposite. Their parallel movements on the dial create a magical space extravaganza of the smooth motion, which occurs on the background of Indonesia's natural mother of pearl, with its unusual color perfectly complemented the "cosmic" picture. The picture is completed with delicate hands, made of fluorescent material. The basis of the watch became an automatic caliber SO384, with a reserve of 42 hours. It drives the hour and minute hands, calendar and moon phase indicator. The watch case in diameter of 38 mm is made of stainless steel. The 12-angle bezel is encrusted with 72 diamonds, total weight approximately 0.58 carats. The watch functions are controlled by the crown. The brand name and company logo are depicted on the inside of the sapphire glass by means of the original method of metal deposition. On the back of the watch case is "closed" by a sapphire crystal on the four screws. The women's watches Admiral's Cup Legend 38 Mystery Moon is equipped with a white or a black satin strap with triple folding clasp engraved with the logo of Corum. The watch water-resistant - 30 meters. The women's watches Admiral's Cup Legend 38 Mystery Moon with a black dial - Ref: 384.101.47/F149 AN01.